The anterior cruciate ligament (ACL) is one of the four primary stabilizing ligaments in the knee joint. The ACL prevents the shin bone (tibia) from sliding too far forward, allowing for cutting, pivoting and jumping activities. How can you injure the ACL? The most common ACL injury can occur from a combination of sudden stopping and pivoting or twisting on the leg. The ACL can also injure in contact sports where the player is clipped forcing the knee into an abnormal position. There are a multitude of scientific studies indicating that females are at a 4-6 times higher risk of ligamentous knee injuries compared to their male counterparts. A high percentage of these injuries occur in non-contact sports, but also with sports involving pivoting, cutting and landing from a jump. The player will most likely experience a “pop” following a feeling of instability, pain and increased swelling of the knee joint(called an effusion). Over the next several hours, pain will increase and it may even be difficult to walk. Later, a feeling of giving way or buckling in the knee joint may be reported. Conservative Treatment: Some patients, particularly those over the age of 30 who are not highly active, may not require surgery. These patients can function very well as long as they avoid high risk sports such as skiing, basketball, soccer and football. Wearing a knee brace may help stabilize the knee, improve function and can help prevent re-injury but this is individualistic. 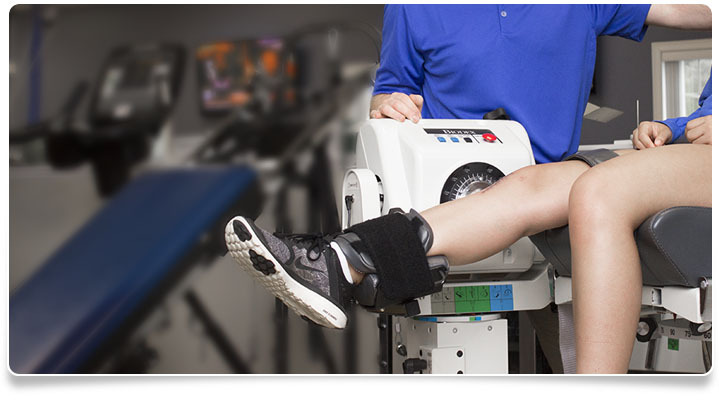 These patients should participate in physical therapy to restore strength, power and endurance in the knee joint. 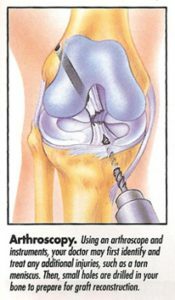 Limited Arthroscopic Surgery: ACL injuries may also be accompanied by injuries to additional structures of the knee joint including torn meniscus or fragments of the articular cartilage creating a loose body in the joint. Symptoms include the knee joint locking, pain and swelling. Arthroscopic surgery can remove the torn meniscus or loose body improving the patient’s pain and eliminating locking; however will not resolve the instability of the knee associated with the torn ACL. 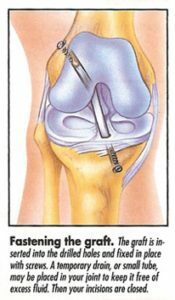 ACL reconstruction: ACL reconstruction involves replacing the ACL with a tendon (or a graft) with another structure within the knee. There are generally three different grafts that orthopedic surgeons use. The surgeon chooses the type of graft depending on the patient’s age, activity level and personal preference. The rehabilitation is similar for all three grafts. Middle third patellar tendon: the tendon that connects the knee cap to the shin bone (tibia). The oldest and repeatedly proven successful in the literature. Hamstring tendon: the tendon of the back of the thigh muscle take from the inner thigh to the back of the knee is used. Allograft: tendon grafts taken from a cadaver. There are several different protocols that orthopedic surgeons recommend following surgery. Listed below are examples of activitie on a timeline (accelerated for athletes vs. non-accelerated for patellar third reconstruction) that your doctor may prescribe. Please be advised that this is only a sample protocol and your doctor will recommend what is best for you. It should also be noted that an accelerated protocol will most likely not allow for a quicker return to competitive sport any sooner than non-accelerated protocol.